The factors of survival and sustainability will be studied as the essential motive force of any given Diaspora. Survival in the context of Diaspora communities implied the struggle for physical subsistence but at the same time the struggle to regain a sense of identity and faith in the self, the community and the future. Special attention will be given to the notion of trust, as it relates both to man’s trust in the divine as well as in his own strength and in the world around him. Russians leaving their homeland due to political circumstances at the beginning of the 20th century were faced with the challenge of rediscovering and reshaping an identity that sprang out of the traditions of their country, reconsidered from the distance of exile. Ultimately, this process resulted in the renewal of Orthodoxy, as the refugees saw their past with new eyes and were in a position to approach their religious identity independently of the official church of the imperial Russia. Russian hubs of thought represent a successful example of Diaspora communities in communication and fruitful dialogue with the local churches and society. Finance represents a distinct area in which the Greeks excelled in the 20th century. As financial or economic immigrants, the Greeks found in Western Europe and the States the space to develop their potential, while also establishing communities with distinct characteristics. Issues of national and cultural identities will be considered in this session, which draws on examples from the fields of law, art, social sciences etc. Poet Giorgos Gotis will read in Greek a selection of his poems on Memory. Andrew Watson will read the English translation. Sessions conclude with round table discussion in which the participation of the audience is very much encouraged. This conference has its origins in the research project Orality and Performance, initiated at the Institute of Historical Research of the National Hellenic Research Foundation in 2015. 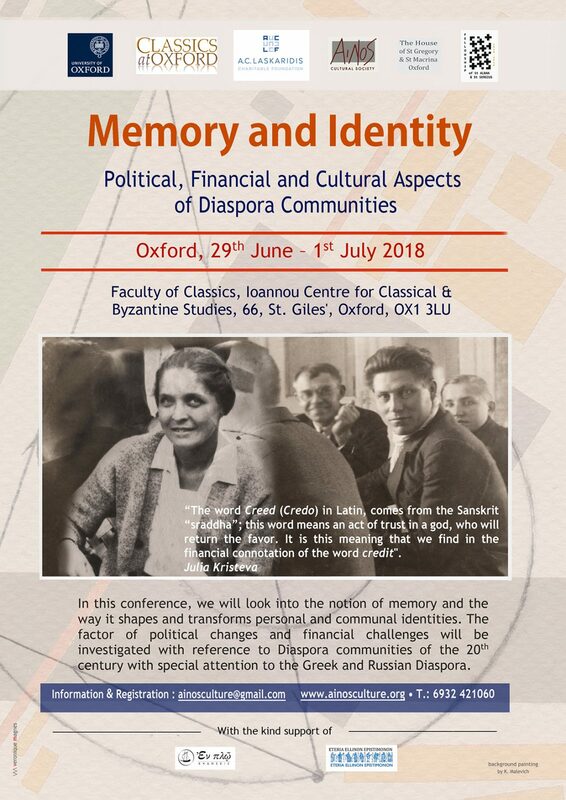 During the academic year 2017-2018 our project focused on the topic of Memory, with a series of activities hosted by the Centre for Hellenic Studies of Harvard University at Nafplio (December 2017) and The American College of Greece (March 2018). Academic supervisor: Dr Niki Tsironis. Ainos culture is based in Athens (Greece) and is the Athens Bureau of the Fellowship of St Alban and St Sergius, Oxford. It contributes to the dissemination of knowledge and the dialogue between cultures, churches and religions through seminars, conferences, exhibitions, cultural trips and video media productions.